Counterstamped coinage of the Philippines during the Spanish rule is in fact the hardest to collect of all numismatic rarities of the Philippines. Due to few available references for collectors like that of the books of Dr. Orphilla-Fortich and Pablo De Jesus, no other local numismatists have continued the study of Philippine Counterstamped coinage since. Several individuals attempted to make further research on countermark coinage such as the prominent Barilla co-founder Dr. Benita Legarda, and other known officers from the organization Philippine Numismatic And Antiquarian Society (PNAS) but the short lived effort that managed to acquire some important specimen such as the SASTRE countermark for the BSP Money Museum have only produced facts that have already been outdated by time and the need for further expanding the avenue of research on the subject of Philippine Counterstamped coinage. On March 13th October 1828, Don Mariano Ricafort, Captain General of the Philippine Islands, a subdivision of the Vice-Royalty of Mexico, issued an edict introducing a system of marking the “pesos y onzas de oro” produced by the “provincias insurectas y gobiernos revolucionarios” of the South American continent so that such subversive words as “Republica”, “Indepencia”, and “Libre” commonly seen being bannered on the newly coined silver crowns of Peru, Bolivia, Colombia, and others be obliterated. 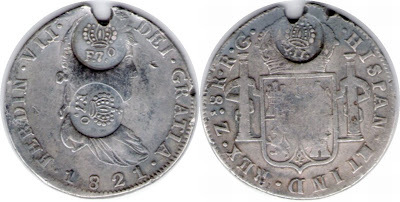 The Spanish mint introduced machinery that could re-coin such silver crowns defacing them with their original legends and be replaced instead with that of “Habilitado por el Rey N.S.D. Fernando VII”, surrounded by a wide serrated border. The authorities of the still remaining colony in the East, the Philippines, desperate to oppress the awakening of the revolutionary spirit, devised a system that would not allow the flow of the new revolutionary coins into the Philippines. Though crude and still not tested, the re-coining process was initiated in the year of 1828 by stamping the new coins with the large “MANILA” to assert the colonies restriction that otherwise guaranteed acceptance for trade and commerce. The production was however halted after less than 5 years of operation because the die easily worn out and later broke down thus, the authorities have decided to replace the die with a much simpler oval or circle countermark. It was not until the 27th of October in the year of 1832 that Don Pascual Enrile, the new Governor of the Islands, resurrected the mint’s stamping office replacing the complicated procedure with a much simpler oval punch. During that same year, the local authorities implemented the piercing of foreign and older coins as similar to modern day demonetization therefore making them obsolete and not for circulation anymore. Piercing was usually done and placed on the 12 o’clock on the obverse of the coins that have therefore created holes on the coins similar to that of medals and amulets. The countermark coinage of 1832 was not only for the purpose of stamping but otherwise for the revalidation of the obsolete or pierced currencies. In the strict sense of grading coins, pierced or holed coins have to be graded less or appraised at a lesser value which would be considered degrading to the coins catalogue value. However, there is always an exemption to that rule and this can be applied to revalidated coins. Historical records however does not indicate if the piercing of coins were officially done by the mint itself or by supervision to its citizen, whether voluntary or mandatory, or with application of standard tools or not but for some reason however, only one thing is for sure, only a handful of revalidated coins have surfaced in the past and each specimen can be considered unique to its own category. The policy of revalidation however does not only occurred during the reign of Ferdinand VII, the later reign of Queen Isabel II otherwise adopted the same policy. However, it can be noted that the implementation of the policy that time was rather conservative and stricter which manifested on the specimen that have surfaced. The YII countermark can only be seen on F70 countermark revalidated coins and this can be proven by all specimens that have been previously collected. 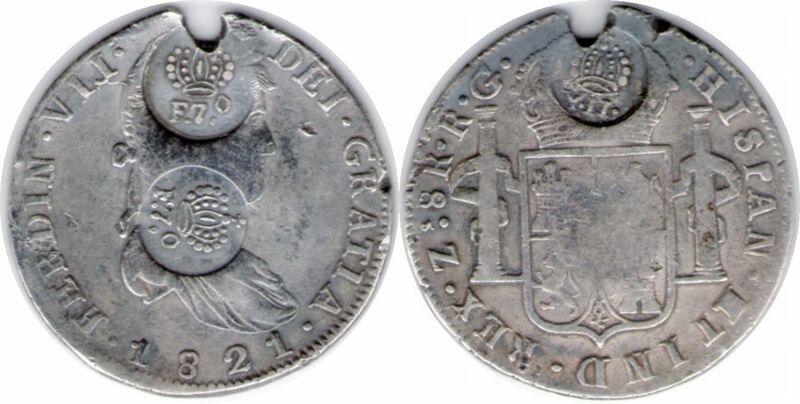 No specimen that only have “YII” or Isabel II countermark been placed either one or both holes of pierce coins without initially been stamped either by the “1828-1830 Manila” or Ferdin VII oval countermark have ever been found. There are YII countermarked holed coins but these however cannot be considered connected to the same type of coins such as the coin below. Yet the cream of the crop still has its own cream on top. 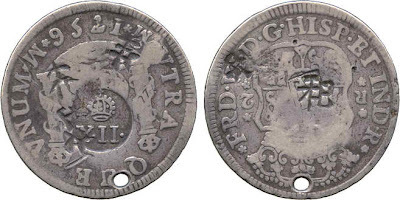 Among the favorite specimen of the revalidated coinage is the 1828 MANILA with a Ferdin VII oval countermark on its hole previously sold in an auction held by PNAS several years ago. Also a specimen to be considered unique is a Peru Libre 1823 with triple countermark, F70 on obverse and YII on both sides of the hole. Another impressive specimen is the Ferdin VII 8 reales minted in Zacatecas Mexico with triple countermarks including both Ferdin VII and Isabela II countermarks. However, what makes this coin special are the two different countermarks placed on each holes, F70 on the obverse and YII on the reverse. Most noted specimen with two countermarks on both holes has one monarch’s countermarked placed on both holes either with Ferdin VII or Isabel II only. Different monarch’s countermarks are excessively rare and can be considered as a valuable treasure of Philippine numismatic.